On February 6th, 2010 at around 11:30am while in South Florida for the Super Bowl, 22 year old Anthony Purcell jumped into Miami Beach waters and never came back up. Growing up in Florida, Anthony knew the beach and waters well. Thinking the water was deeper than it actually was, he dove into a sandbar and broke his neck and bruised his C5 and C6 vertebrae. Thanks to his cousin who pulled him out of the water as well as medical staff who acted quickly, Anthony survived the life threatening accident, but tragically – he was paralyzed. According to traditional medical prognosis, spinal cord injury victims are normally told their chances of living an independent life are slim to none. Told to start getting comfortable in wheelchairs, Anthony’s mother, Micki, refused to accept this narrow way of thinking and started getting deeper into the world of spinal cord injury rehab. She was disturbed at what she found. While she watched Anthony improve with each day, she discovered that other victims weren’t so fortunate. The more research she did, the more she realized that most suffering from a spinal cord injury don’t have the resources necessary to achieve a successful recovery. 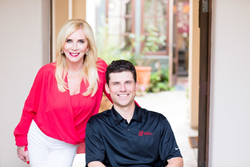 Founded by Anthony’s mother, Micki Purcell, Walking With Anthony was born out of Anthony’s devastating spinal cord injury. Devoted to helping people stand up to their wheelchairs, Micki learned through her experiences with Anthony’s injuries that victims and their families don’t know where to go for help. Tragically, thousands of people with spinal cord injury are trapped in a wheelchair and every day, medical institutions tell them they will never walk again. The National Spinal Cord Injury Statistical Center states there are 1 in 50 people living with a spinal cord injury – with around 17,500 new cases occurring each year. Studies have shown that the average amount for rehabilitation for spinal cord injury is close to $100,000 a year and most insurance companies only provide coverage for an average of 21 days. Working tirelessly to forever change the recovery outcome of spinal cord injury, Walking With Anthony helps those who suffer get access to therapies that have miraculously helped many people get stronger, and gain independence. Today, Anthony is stronger than ever. With his new bride by his side, he is healthier and gaining independence back step by step. Driving and even bench pressing 190 lbs, Anthony gets closer and closer to living an independent life – self-sufficient and thriving. Now, Micki and Anthony wake up each morning with purpose. Driven to help as many spinal cord victims as possible through Walking with Anthony, every penny donated to Walking With Anthony goes directly into the charity’s work with those who are emotionally and financially drained by these traumatic life events. Tough times don’t last – tough people do. Make a difference in the lives of others through the empowering, committed charity Walking With Anthony! Learn more about Anthony and Micki’s story at http://www.walkingwithanthony.org. If you would like to schedule an interview or segment, please contact sarah(at)chicexecs(dot)com.